For millions of Brazilians — not to mention football fans around the world — the wait is now almost over. The host nation are favourites and support for the team has grown as the big kick-off has edged closer — despite protests over the amount of money the country has spent on staging the tournament. Brazil take on Croatia tomorrow in Sao Paulo (5pm) in front of an expectant nation and, after a lukewarm reaction to recent warm-up games, right-back Dani Alves says tomorrow night is all that matters. He told reporters in Brazil: “The moment of truth is starting now. The build-up to the event has been marred by demonstrations and anger by people who feel that the money ploughed into the World Cup should have been spent in other areas of the country. 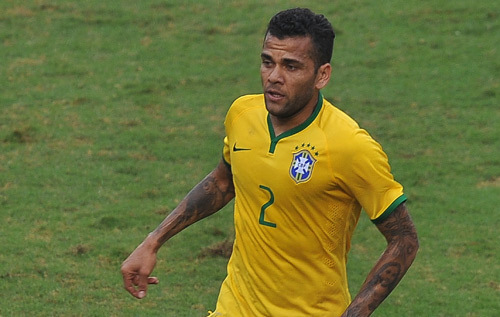 But Alves believes the joy the month’s feast of football will bring will outweigh the troubles. “For us it’s a gift to see the fans, our people, now understand that the Cup has arrived in Brazil and it’s going to be an amazing moment,” said Alves. Meanwhile, Argentina head coach Alejandro Sabella says star player Lionel Messi’s habit of throwing up on the pitch is down to anxiety. Messi scored against Slovenia on Saturday, scoring Argentina’s second just after TV cameras showed him dry-heaving and receiving a tablet from the bench. Messi has often been accused of not trying hard enough for his country, which he admits affects him.